Fujifilm's FinePix JZ500 is a compact point and shoot digicam with a few additional features intended to differentiate it from other similar models and justify its slight increase in price when compared to Fuji's many other point and shoots, almost all of which offer similar resolutions, body sizes, and designs. 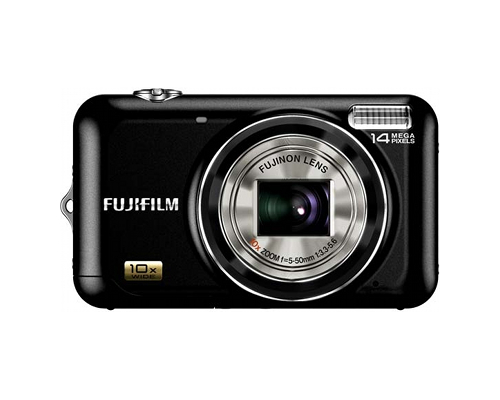 The camera captures images at a maximum resolution of 14.1 megapixels using a 1/2.3" CCD. The camera captures still images using JPEG (compressed using Exif v2.2), movies using the AVI container format (containing motion JPEG and WAVE audio). Sound is monaural. Still images come in a variety of resolutions based on aspect ratio, and can be produced at 4320 by 3240, 4320 by 2880 (3:2), 4320 by 2432 (16:9), 3072 by 2304, 2048 by 1536, 1920 by 1080 (16:9), 1600 by 1200, and 640 by 480. Video can be captured at 320 by 240, 640 by 480, and in high definition at 1280 by 720. The camera offers a 10x optical zoom lens with a range of F3.3 (Wide) and F5.6 (Telephoto). Its focal length is between f=5 and 50 mm, equivalent to a 35mm camera with a range between 28 and 280 mm. It also includes a digital zoom up to 6.4x, capable of moving up to 60x when combined with the optical zoom. Aperture can be set between F3.3 and F6.4 in Wide and F5.6 and F11 in Telephoto. The camera includes many shooting modes. Its mode dial can be set to SR AUTO, Auto, Natural Light, Natural Light & with Flash, SP1, SP2, Movie, P and in SP it can be set to Portrait, Portrait Enhancer, Landscape, Sport, Night, Night (Tripod), Fireworks, Sunset, Snow, Beach, Party, Flower, Dog, Cat, and Text. It also includes a CCD-shift type image stabilizer. The camera's shutter functions at speeds between 1/2000 of a second and 4 seconds, and includes an automatic mode that can be set between 1/2000 of a second and 1/4 of a second. Continuous shooting can function up to .9 frames per second. The camera offers several tracking and detection modes not offered by other cameras in the FinePix line, such as cat and dog auto detection. The camera connects to printers or computers with USB 2.0 and can output video using either NTSC or PAL. It gets power from a lithium ion battery or an AC adapter, rated at about 230 shots before requiring a recharge. An included external charger is required to charge the battery.